Chief Master Sgt. of the Air Force Kaleth O. Wright, Col. Julian Cheater, 432nd Wing/432nd Air Expeditionary Wing commander, Col. James Price, 432nd WG/432nd AEW vice commander, and Chief Master Sgt. Jamie Newman, 432nd WG/432nd AEW command chief, pose under an MQ-1 Predator at Creech Air Force Base, Nev., Oct. 20, 2018. 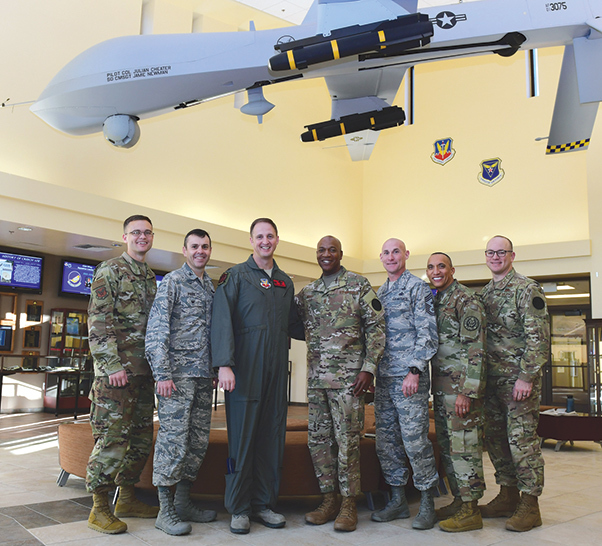 During his first visit to Creech, Wright met with Airmen from various career fields, acted as a sensor operator in an MQ-9 Reaper flight simulator and got an up-close look at the Reaper Remotely Piloted Aircraft. Chief Master Sgt. 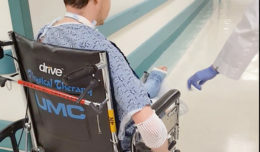 of the Air Force Kaleth O. Wright visited Creech Air Force Base, Nev., for an in-depth look at the Remotely Piloted Aircraft enterprise and the Airmen who ensure the nation’s security. 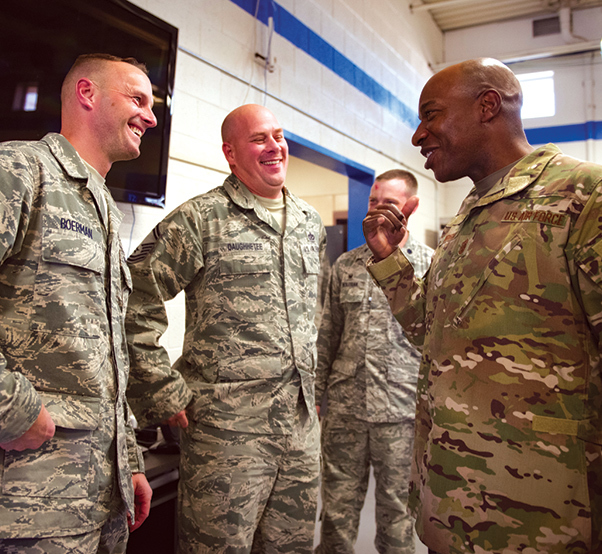 This was Wright’s first trip to Creech, and he made time to meet with the Airmen who support the persistent, dominant attack and reconnaissance mission. 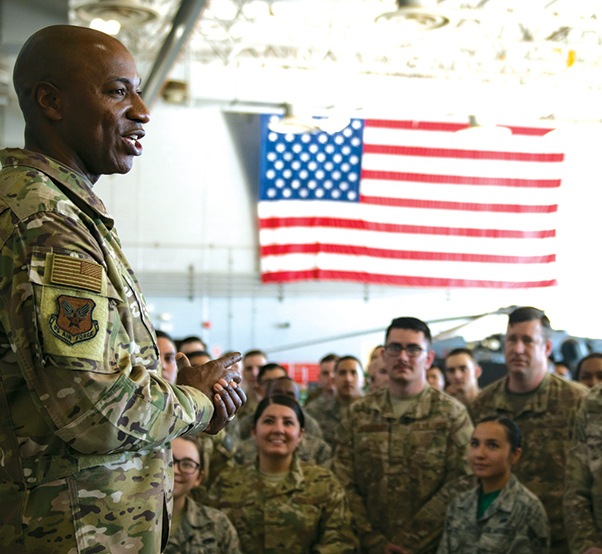 Wright had the opportunity to tour the 432nd Wing/432nd Air Expeditionary Wing and base operations, stopping by the 432nd Maintenance Group, 42nd Attack Squadron, 432nd Aircraft Communication Squadron, and the 799th Security Forces Squadron. He also flew a training mission with the 432nd Operations Support Squadron’s MQ-9 flight simulator. 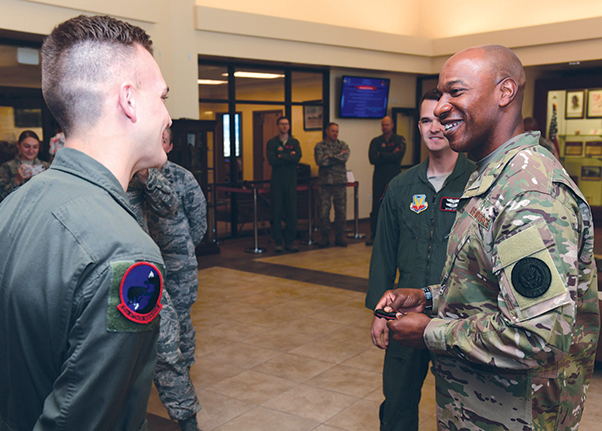 While visiting the units on base, he recognized some of the wing’s superior performers, and expressed the significant impact Creech Airmen have in today’s operational success. Chief Master Sgt. of the Air Force Kaleth O. Wright recognizes Airman 1st Class Ethan, 17th Attack Squadron sensor operator, for his exceptional performance at Creech Air Force Base, Nev., Oct. 20, 2018. Five outstanding Airmen were selected to meet with Wright and be recognized for their contributions to the Remotely Piloted Aircraft enterprise. 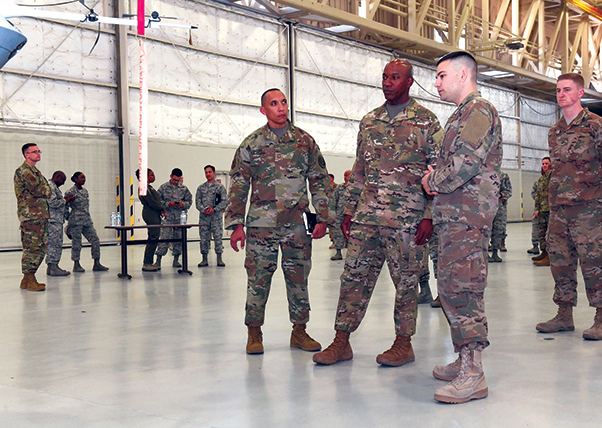 Wright held a question and answer session with Creech Airmen during a luncheon, discussing changes like the transition to Operational Camouflage Pattern uniforms and opening the floor for constructive input. Chief Master Sgt. of the Air Force Kaleth O. Wright takes a look at the MQ-9 Reaper during a briefing at Creech Air Force Base, Nev., Oct. 20, 2018. As part of his first visit to Creech, Wright had the opportunity to talk to maintenance Airmen about the MQ-9 and learn about their unique Remotely Piloted Aircraft mission. 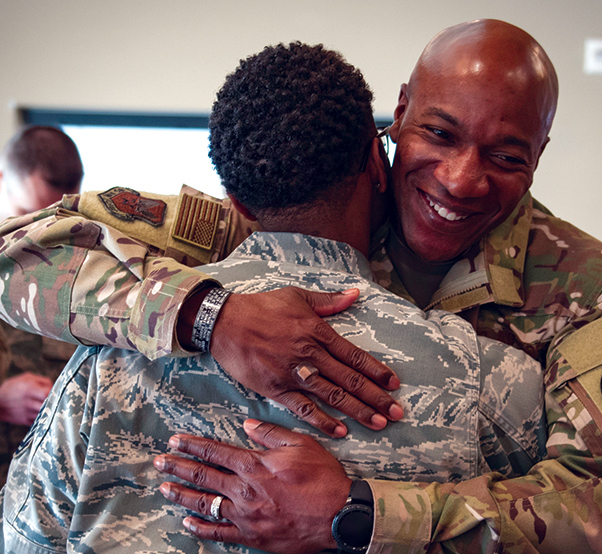 Just as Airmen appreciated learning from Wright, Wright was equally impressed when he found how empowered men and women of the 432nd are in their warfighting efforts. Chief Master Sgt. 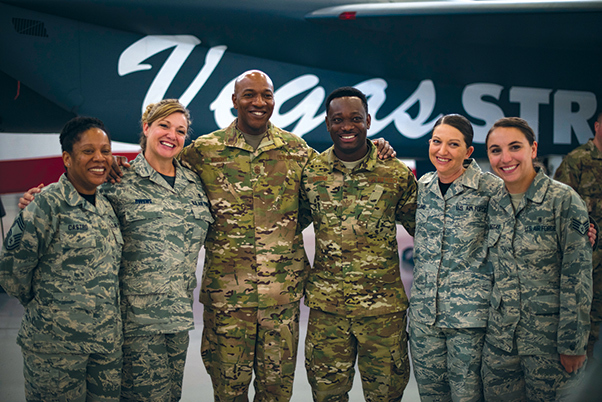 of the Air Force Kaleth O. Wright stands with Airmen assigned to the 99th Medical Group, Oct. 19, 2018 at Nellis Air Force Base, Nev. Wright visited multiple areas on base to meet Airmen and learn about what their roles are at Nellis AFB. Chief Master Sgt. 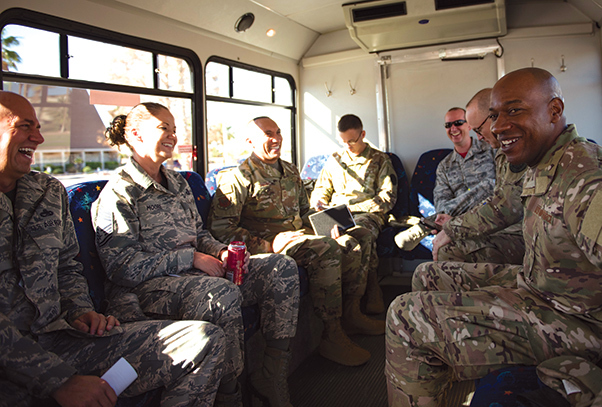 of the Air Force Kaleth O. Wright shares a laugh with base leadership during a tour Oct. 19, 2018, at Nellis Air Force Base, Nev. Wright and his team traveled to multiple units across Nellis AFB to meet Airmen and learn about the different roles and responsibilities that they have. Chief Master Sgt. of the Air Force Kaleth O. Wright greets one of his former Airmen, Tech. Sgt. Amanda Taylor, 726th Operations Group command support staff superintendent, during a base tour Oct. 19, 2018 at Nellis Air Force Base, Nev. Wright and Taylor were stationed together at Osan Air Base, South Korea, between 2007 and 2008, where they used to play basketball together. Chief Master Sgt. of the Air Force Kaleth O. Wright answers Airmen’s questions at Creech Air Force Base, Nev., Oct. 20, 2018. Some of the topics that were discussed during Wright’s visit were upcoming base changes, mission readiness and the importance of national security. Chief Master Sgt. of the Air Force Kaleth O. Wright experiences what it’s like to fly as an MQ-9 Reaper sensor operator in a flight simulator at Creech Air Force Base, Nev., Oct. 20, 2018. 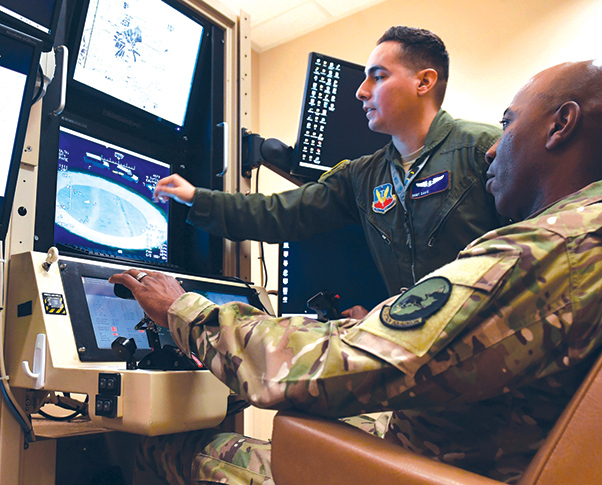 These simulators help MQ-9 pilots and sensor operators keep current with flight training and hone their skills in realistic combat situations. Chief Master Sgt. of the Air Force Kaleth O. Wright stands with Airmen assigned to multiple units across base Oct. 19, 2018, at Nellis Air Force Base, Nev. Wright visited areas on base to meet Airmen and learn about what their roles are at Nellis. Chief Master Sgt. 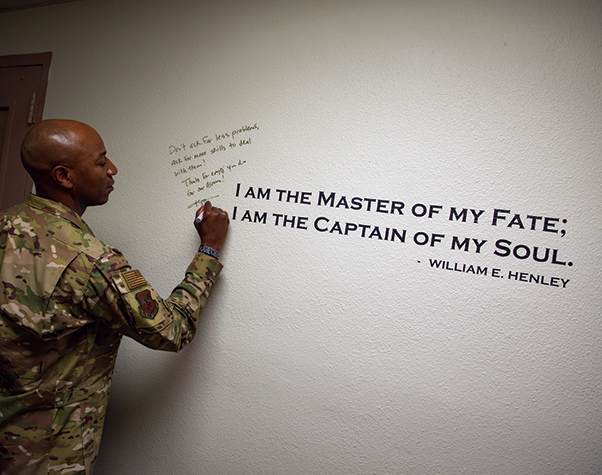 of the Air Force Kaleth O. Wright speaks with Chief Master Sgt. David Boerman, 99th Civil Engineer Squadron chief enlisted manager, and Senior Master Sgt. 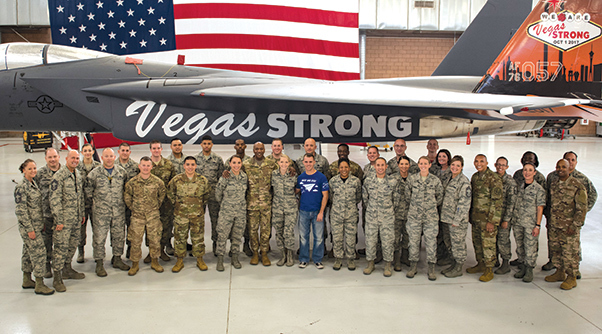 Jason Daughhetee, 99th CES engineering flight superintendent, Oct. 19, 2018, at Nellis Air Force Base, Nev. Wright and Daughhetee were stationed together at McConnell Air Force Base, Kansas, between 2012 and 2013. Chief Master Sgt. 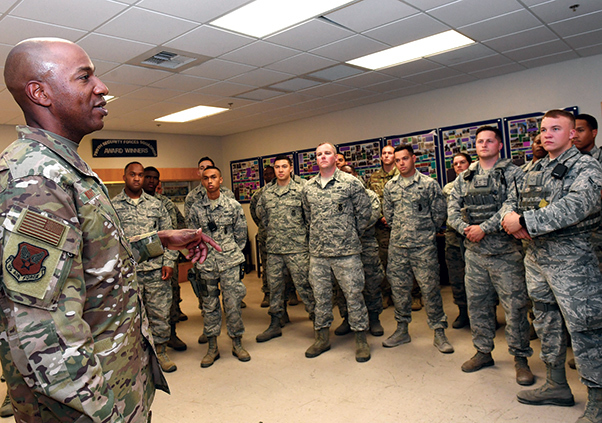 of the Air Force Kaleth O. Wright speaks to members of the 823rd Maintenance Squadron during a base tour Oct. 19, 2018, at Nellis Air Force Base, Nev. Wright spoke to Airmen about upcoming policy changes.